zoe & morgan ring, similar here: This ring holds a lot of personal meaning for me, meaning which I'll leave in a corner of my mind. I guessperhaps it's that sentimentality I like about it more than anything. I do really love the design though-stars and moons feature in a few of my favourite pendants and earrings already. Unfortunately you cannot get this exact design anymore as it was part of an end-of-season sale but I highly recommend you check out Zoe and Morgan's extensive range. dodie clark: So I've been listening to a lotta music all month but the one artist I keep coming back to is Dodie. Her music is confessional, relatable and gives me Zooey Deschanel of She & Him vibes. I'm terrible at describing music I'm sorry. It's catchy and brilliant and I'm a Dodie fangirl anyways but I recommend you give her a listen. I love Human and Secret For The Mad atm. my year of rest and relaxation x ottessa moshfegh: Given I've been thinking about this book all week since finishing it and asking myself what my own personal year of rest+relaxation would look like, I'd say this left an impression. What a book. The main character is incredibly unlikeable yet I found myself understanding why she did what she did. She largely withdraws from New York city life and instead escapes c/o prescription drugs, watching a lot of Whoopi Goldberg and Harrison Ford films, surfacing for the occasional shopping spree. Her and her best friend Reva act as mirror-images of one another. Seeing what they want to see in themselves and in turn each other-bringing out their best and worst sides. It explores topics of escapism, addiction, celebrity worship and of course the questioning of identity that seems to go hand in hand with twenty-something life. It's darkly funny and brilliantly written. colourpop palette, similar here: I won't say too much about this palette because it's no longer available but I take it away with me all the time, including my recent travels to Melbourne and it is so useful. I don't know how I used to have one of those 15-pan MAC palettes because honestly I can get away with six shadows like this, maybe a couple of cream ones and be done. 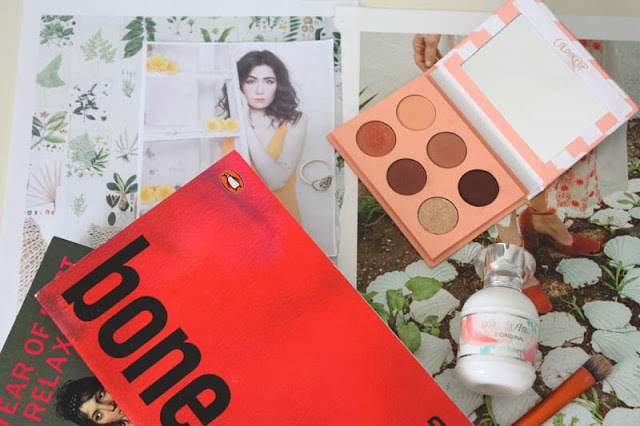 Anyway, Colourpop's eyeshadows are cheap as chips, deliver on the pigment stakes and are just bloomin' lovely. I can't fault 'em. anais anais x cacharel: I recently bought a bottle of this for my friend when I was on holiday and I decided to get myself one too. One because I'm a copycat and two because I wanted a small perfume to throw in my bag. I feel like smaller perfumes are harder to come by/really expensive here in NZ. Anais Anais is a classic and according to Pretty Iconic, it was to teens of the eighties what Daisy Marc Jacobs was to my generation. Its scent is floral and has base notes of amber and sandalwood. I think I like it though because it reminds me of Glow x jLO which was one of my first perfumes and pre-teen me used to spritz that around on special occasions. Side note; how great is Chemist Warehouse? Cheap fragrances and Bioderma. Yes ploise. expert concealer brush x real techniques: If Priceline is anything to go by, Australia love themselves a bit of Real Techniques. Seriously, I have never seen so many of their brushes in one place. When I was over they were on special so I nabbed the concealer brush. With Real Techniques brushes you are guaranteed brushes that will do the job and then some-you could use this with cream eyeshadows too if you really wanted. 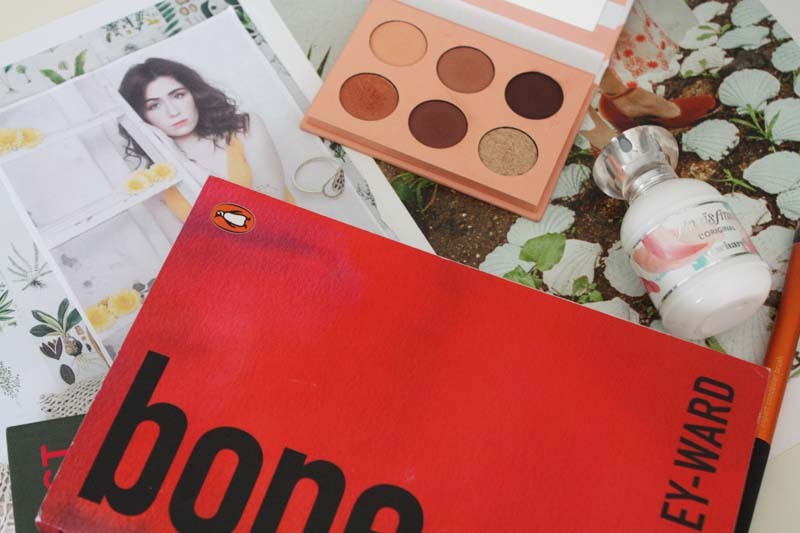 It makes blending concealer an absolute dream though and I love that. 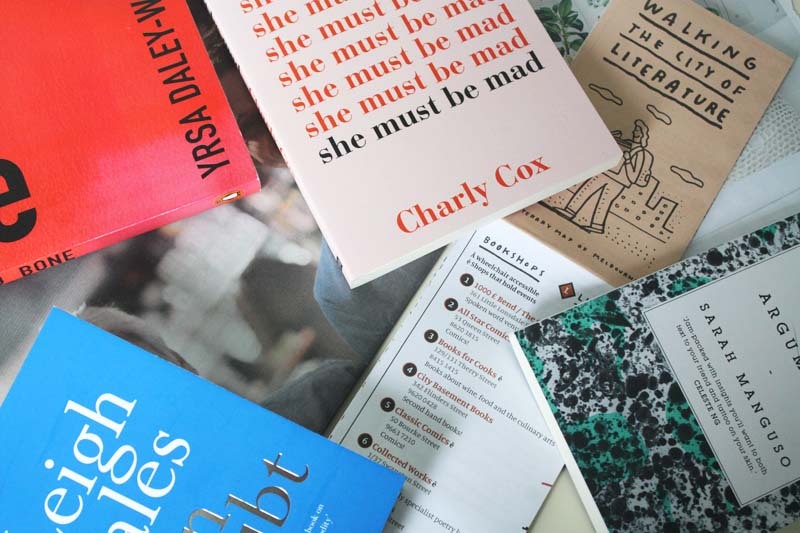 bone x yrsa daley-ward: Another book, this time poetry. A purchase enabled by the one and only Tara. Also indirectly enabled by Florence Welch who selected it for Between Two Books back in the day. I've not read anything quite like it. Poetry and storytelling that feels so truthful and in turn powerful. I deliberately drew out the process of reading this book because I wanted to make the experience last but I know it's one I will be going back to and annotating to oblivion. Daley-Ward's memoir is unsurprisingly at the top of my wishlist right now. -what have you loved during september? Poukahangatas x Tayi Tibble: Honestly, the synopsis over on the Victoria University Press page linked sums up this book far better than I ever could. Pop culture, identity, culture all told through a fresh, raw and real lens. I'm not sure how I can write on this cohesively without sounding like a fangirl but I love Tayi's work. If you can get ahold of this book, you absolutely should. #ihavethisthingwithearrings: I've admired Emily Green's pieces from afar for a while so when I came across them in person at the beginning of the month, well, I got excited. Seriously-It took me a while to choose a pair because I wanted all of them. Anyway, I opted for these drop earrings. Photos don't do them justice. They are stunning and I'm going to get so much wear out of them in the coming months. Red Magazine: Shout out to Liv for bringing this brilliant magazine to my attention. The issue above is extra special actually because Liv is featured in its pages. Yay for internet pals doing awesome things. Anyway, Red is a women's lifestyle magazine but with a healthy dose of fashion, literature, inspiring women and brilliantly written articles. You all know I'm a bit of a Dolly Alderton fangirl. Well, she is one of their monthly columnists. 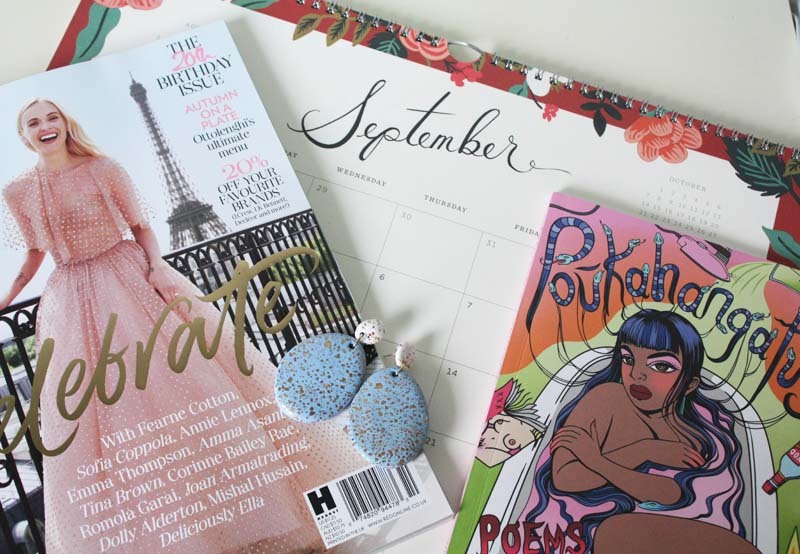 I love that they seem to feature a hefty dose of books each month too, rather than the odd scattered paragraph. It's a lovely lil' all-rounder. Feminists Don't Wear Pink / Podcast: I've been lucky enough to receive an advanced copy of the book, accompanying this podcast and it's brilliant. I'm not here to talk about the book today though. Scarlett Curtis, the brainchild behind Feminists Don't Wear Pink set her first podcast episode live earlier in the week. It's a brilliant banter-fest with her best friend, who just so happens to be Saoirse Ronan. Saoirse is also the author of the debut essay in the book which is brilliant and they talk more about it here. I'm looking forward to the upcoming episodes, especially Jameela Jamil's. She is slaying the Internet at the moment. "In order to thrive, I have to subscribe to the belief that I do not owe everyone, everything...I am withholding, I am not withdrawing. Just as I am not sharing all of the bad stuff, I am also not sharing all of the good stuff. The best stuff. I don't want to curate a shiny, social-media version of my life...I also don't want to write long, broken narratives about various issues I face because I do not want to invite conversation into what I am still figuring out. It's delicate. It's fragile. It's mine." 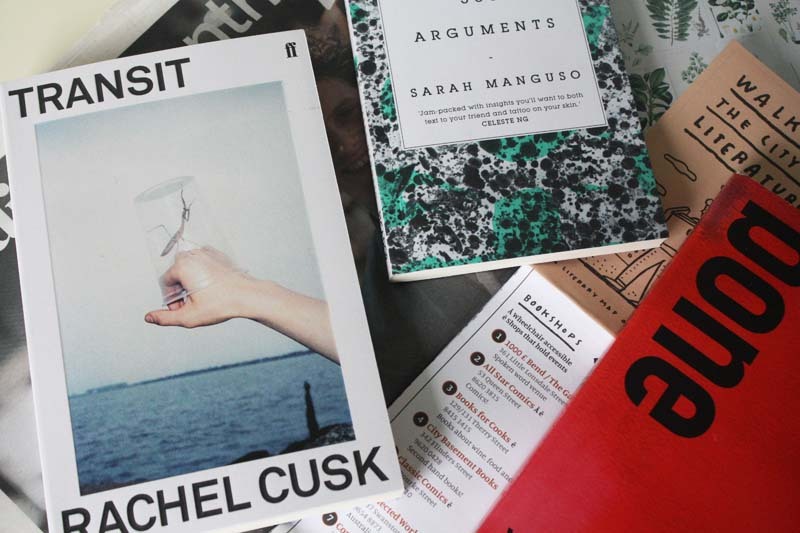 transit x rachel cusk: I've been reading Outline, the first in Cusk's trilogy and love the conversational style and the way dialogue pushes the story forward. It is written in a beautiful, fluid way as well so when I saw Cusk's books on a table at the Melbourne Writers Fest I had to whisk book two away. It'd be rude not to. 300 arguments x sarah manguso: One of the indie bookstores I discovered on this trip was Hill of Content. Upstairs they had an amazing essay selection and it was here that I stumbled upon Sarah Manguso. 300 Arguments isn't really your typical essay collection but rather a steady stream of consciousness. It jumped off the shelves to me because I've toyed with the idea of writing like this and wanted to see how it reads, quite literally. I loved it. If you don't like books that challenge the formulaic structure of writing then it won't be for you. It's short and sweet but reflective too and I love that it puts a new twist on the traditional essay. bone x yrsa daley-ward: A book I have wanted to own for the longest time and it does not disappoint. In fact, this may well be one of my new favourite poetry volumes. The fact Florence Welch sung its praises obviously helped but seriously, her writing is beautiful and refreshing. I really want to read her memoir, the terrible asap. 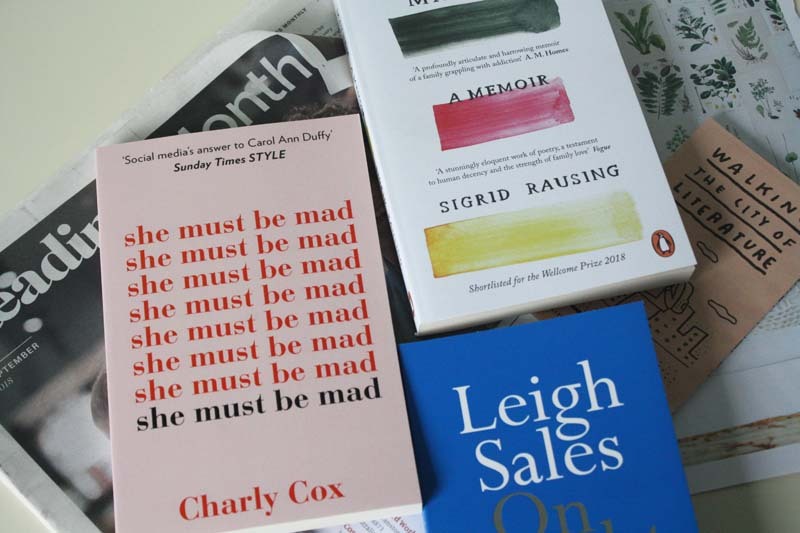 she must be mad x charly cox: Another book of poetry, this came highly recommended to me by the lovely Sandrine and she has top notch recommendations. That and I heard an amazing episode of Emma Gannon's podcast with Charly and it enticed me further. I'm saving this to read because honestly I am in and out of enough book as is right now. mayhem: a memoir x sigrid rausing: This has been on my wishlist for an age now and I got it so I can finally read it. That and I want to pass it on to one of my friends when I am done so we can discuss it further. I know this isn't going to be an easy read but in my opinion, difficult books can often be the most rewarding. on doubt x leigh sales: Another essay, this time a look at doubt and the media and journalism. It also considers Australian and US poliics among other things. I'm not selling this book well but the premise really grabbed me and I am enjoying it so far. -what books have you grabbed lately? *Oh yeah, PSA-In case Instagram didn't make it clear enough-I spent six days in Melbourne at the end of August+beginning of September and it was amazing, I had such a good time, solo trips w/ a smattering of company are the best and I am a huge advocate for traveling alone and just running with it.